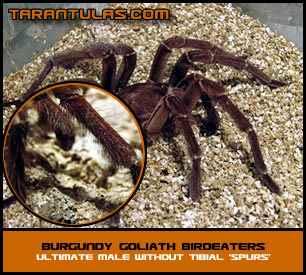 TARANTULAS.com is the United States breeder of the "BURGUNDY GOLIATH BIRDEATING SPIDER". Goliath birdeaters are the largest spider in the world with legspans of twelve inches and weights of 5 or 6 ounces possible! This Guyanan race of Goliath has recently been described as a third species of Theraphosa — Theraphosa stirmi . It's adult coloration, temperament and comparative ease of breeding set it apart from other goliaths, but the two distinctive traits are a lack of "mating hooks" in ultimate males coupled with the presence of "pink-feet" in early instars [spiderlings & juveniles]. Like the common Goliath Birdeater [Theraphosa blondi], ultimate [mature] males lack tibial apophyses, or mating spurs. However, like the Goliath Pinkfoot [Theraphosa apophysis], it has pink "feet" [tarsi] as a spiderling and juvenile, which is not the case in T. blondi. 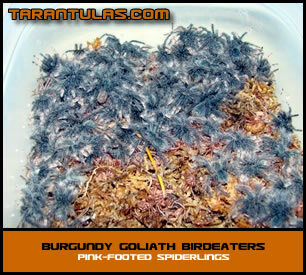 Adult specimens are huge, heavy-bodied and have a post-molt color of rich burgundy-brown with distinctive reddish hairs on legs and abdomen post-molt. They also seem to have a more ferocious temperament than other goliaths. Just like both of the other Goliaths, the 'Burgundy Goliath Birdeating Spider' (Theraphosa stirmi) is a monster with the potential to reach in excess of 10 or 11 inches in legspan if not more. However, what might make this "species" most desirable is a significant difference it seems to have to the other two giants. That is, its apparent ease of breeding. Although getting a T. blondi to mate isn't that difficult, getting good eggsacs and successfully incubating them is. Our experience has shown that the breeding this third variety is quite straightforward. This year our only ultimate male bred with three females, two of which were ready to breed and produced sacs. The females were good mothers and the sacs were left with them for more than a month. Although captive bred goliaths fare very well in captivity (unlike their wild-caught counterparts), goliath bird-eaters are still not recommended for beginner tarantula keepers. Goliaths inhabit humid and swampy rainforest and their range of acceptable temperature and humidity is very narrow. Careful attention to environmental conditions and experience balancing ventilation with moisture and humidity is required by the keeper. Additionally, goliaths have the strongest urticating hairs (a defense mechanism) of any tarantulas and these can cause extreme discomfort to skin, eyes, mucous membranes, etc. We recommend that you have plenty of experience with a wide range of tarantulas in captivity before attempting goliath husbandry. If you feel you are up to the challenge of keeping these monster tarantulas in captivity here are some tips that will increase your chances of success. First, you want to have a fairly moist cage, but you still want to ensure adequate ventilation. The substrate (coconut coir works well) should be moist at all times, but never wet except for in one small area surrounding the water dish. Most of the substrate should be damp enough to clump when squeezed in your hand, but not wet enough that you actually can wring water out of the dirt. (Remember that it is easier to add more moisture as needed than to remove excess moisture when you have mistakenly overwatered.) Use the largest shallow water dish that is appropriate for the size of the spider (never larger than its legspan) and the cage, and always keep it filled. Overflow when filling to saturate the area immediately surrounding the dish, but not the majority of the cage. Feeding your spider as often as it will eat will also help to ensure it is well hydrated. It is important to avoid spraying any tarantula directly, but you may choose to mist the sides of the cage with lukewarm water to increase humidity and remoisten the substrate. Keep the cage in an area that is warm (preferably 76-80°F), but remember that the warmer you keep the spider the more often you will need to monitor the humidity/moisture and the more often it will need to feed. Successful goliath husbandry relies on maintaining sufficient moisture without creating overly wet conditions and stagnant air. In short, it is a balancing act that necessitates the keeper being vigilant about care. Regarding wild-caught goliaths, we don't sell them and we don't recommend you purchase them. This is true of all tarantulas, but particularly important with goliaths. The reason is that they are often collected in the wild by means of gassing them out of their burrows. Not only is this a heinous practice, but it also results in tarantulas in very poor condition. Poisoned out of their homes and subjected to horrible conditions as they travel to enter the pet trade, these spiders more than often than not are sickly, dehydrated and sadly doomed by the time they reach your cage. The British Tarantula Society is the oldest and largest English language organization of tarantula keepers, and TARANTULAS.com sales manager Michael Jacobi is proud to serve on the BTS Committee as North American Representative and as an administrator of the BTS Forum. We encourage serious American tarantula keepers to become an international member in support of this society to receive their beautiful full-color Journal and participate in the Members only section of the BTS Forum. Click on the image below to visit the BTS e-store and become a British Tarantula Society member today!